Day 1 – Wednesday AUG 21st : Departure from Barcelona Cruise Terminal (Spain) at 5 pm. Day 2 – Thursday AUG 22nd : Arrival to CANNES (France) at 8 am. Departure 4 pm. Day 3 – Friday AUG 23rd : Arrival to CAGLIARI (Sardinia Island – Italy) at 11 am. Departure 6 pm. 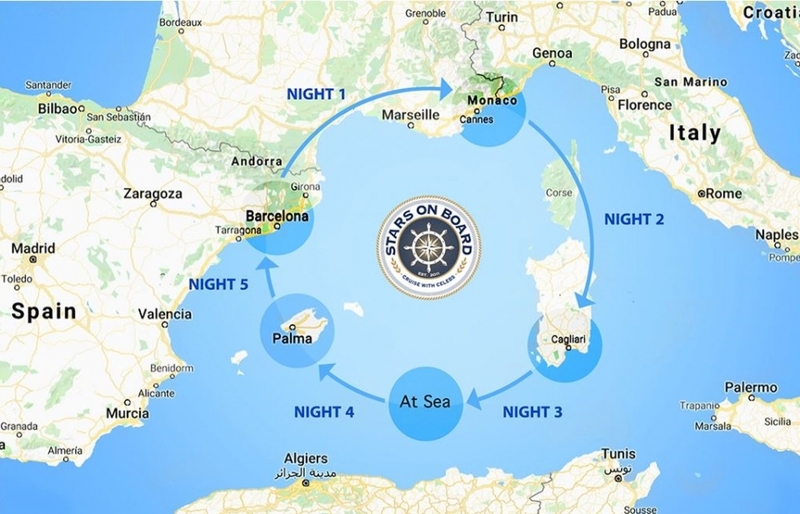 Day 5 – Sunday AUG 25th : Arrival to PALMA DE MALLORCA (Spain) at 8 am. Departure at 5 pm. Day 6 – Monday AUG 26th : Arrival to Barcelona Cruise Terminal (Spain) at 6 am. If you are leaving Barcelona on disembarkation day, we recommend that you book your flights out of Barcelona after 11:00 Noon. Balcony Cabin Category (B)You'll enjoy every inch of these staterooms, with enough space to sleep up to for guests, there are two lower beds that convert into a queen-size bed, one pullman and one single sofabed. Also includes a sitting area and floor to ceiling glass doors that open to a private balcony. Mini Suite Category (M)"THEATER RESERVED SEATS ARE INCLUDED IN THE PRICE"
These incredible Penthouses sleep up to four, with a bedroom with queen size bed and Luxury bath and shower. Also includes a living area, dining are and large private balcony that offers an amazing view. Includes butler and concierge service. These Penthouses are perfect for your whole family. up to six guest can stay in these luxurious Penthouses that include a bedroom with with a queen-size bed and a separate children's bedroom. In addition to the living area, dining area, private balcony and luxury bath with separate shower. includes butler and concierge service. Up to six guests can enjoy these Villas that are perfect if you want to bring the kids. They have one bedroom with a queen-size bed and luxury bath and shower, as well as a separate children's bedroom. Also feature a living area, dining area and private balcony. You will also have access to the private courtyard area. Includes butler and concierge service. These amazing Norwegian Pearl villas sleep up to eight with three separate bedrooms each with a king size bed and luxury bath. with a living room, dining room and incredible private garden with hot tub, you will have more than enough space to spread out and unwind. You'll also have access to the private courtyard area. Includes butler and concierge service. The Cruise price for any cabin includes watching all the Stars performing on board and all Meals (Breakfast, Lunch & Dinner) in the complimentary dining venues. Flight tickets, transportation and other similar services are not included. - After 01 JUN, 2019 - NON REFUNDABLE for any reason. Cancellation Fee is 100%. 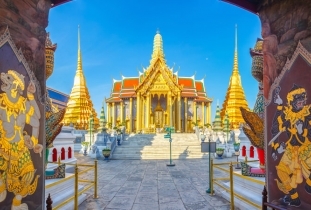 - All guests who need a visa to join this Cruise in Europe are advised to check and apply for a MULTIPLE ENTRY SCHENGEN VISA from the SPANISH EMBASSY in their country of residency. - Usually, Schengen country embassies start receiving visa applications around 3 months prior to the cruise departure date. - During the summer time rush, clients are strongly advised to secure their visa appointments in advance to avoid any unexpected processing delays.